Starring Nancy Kelly, David McLean, James Griffith. Written by William D. Gordon, based on the short story by McKnight Malmar. Miles from civilization, Janet Willsom (Kelly) is stuck in her house in a vicious storm. Adding to her bad night is the female body she finds stuffed in a trunk in her cellar and the mysterious figure prowling outside her window. JS: If you were wondering what happened to that black cat from "La Strega," he hopped on a boat from Italy to the good old U.S. of A. just in time to witness an effectively staged murder in the pre-credit sequence to this episode. PE: Almost like a play, "The Storm" is essentially one woman subjected to every cliche in the horror film book: thunder, lightning, and pouring rain, loose shutters, broken windows, hissing black cat, creepy noises, missing husband, suspicions about said husband, etc. Having said that, Nancy Kelly is brilliant carrying the weight of the show on her shoulders for most of its running time. For quite a bit of that running time, I thought I might have been a bit hasty handing over the Golden Karloff to Jeanette Nolan. 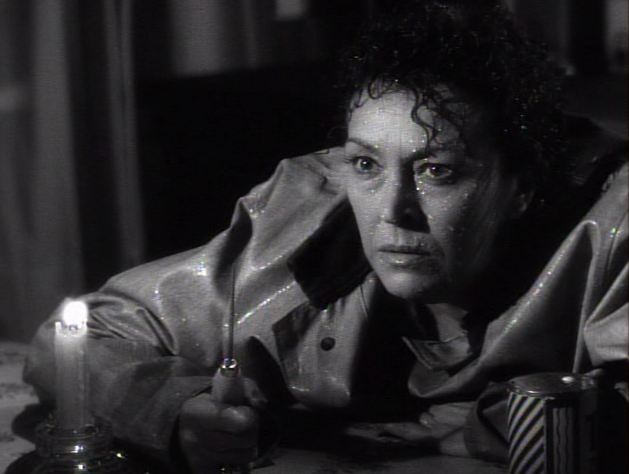 "The Storm" seemed, to me, to be a solid little mid-1950s noir B-movie. JS: It helps that the majority of the episode takes place after the power goes out. For me, the episode is a little long getting to the halfway point, when Janet finds the body in the cellar. From that point on, it takes on an effective "Sorry, Wrong Number" vibe. PE: I'll agree with you there. It's overlong by about 15 minutes. In his commentary, David J. Schow mentions that this episode could be edited down to a half hour and it would be a good representation of the short story. We've hit a good patch of Thriller. Two strong climaxes in a row. JS: Would you prefer a little more time between them? (That depends on what's up around the corner! -PE) I don't think it rates alongside "The Strega." (nor do I -PE) In fact, it harkens back to those early Thriller episodes that just end abruptly. (But, be fair John, those abrupt endings were lame while this is a riveting jolt. -PE) While David McLean's performance is effective, I do think that after investing an hour with Janet, and anticipating the eventual final-reel reveal, I wanted to see someone get their just (or unjust) desserts. Instead, all we get is confirmation of our suspicions, and nothing more. It was ultimately lacking the "Sorry, Wrong Number" punch I thought it was building towards. PE: I thought the climax very effective. It could go two ways: either Janet will make it to the cops and hubby will spend the rest of his days behind bars (or, more likely based on his last minute performance, a loony bin) or he'll get his wits about him and go hunting. Regardless, I loved his breakdown from "loving husband" to screaming animal in a matter of minutes. Were you hoping for the kind of expository we just loved in "The Big Blackout?" I thought the final scene in "The Storm" ranked with "Prisoner in the Mirror." I can't get it out of my mind. JS: Loving husband? Patronizing husband, perhaps. This isn't a Choose-Your-Own-Adventure, Pete. I'm glad you found crazy hubby's tirade so incredible it satiated any need for a conclusion. I don't need everything spelled out—I wasn't looking for the old "he/she kills the other, was caught, tried for the murder and got the electric chair" ending, but I would have liked to have them lean one way or the other; that he was going to get her, or she was going to get him. It's exactly like those earlier episodes I referenced, where you return from the final commercial break and have wonder if you missed the final reel somehow. In discussing it further, you made me realize I was being too generous in my original assessment. PE: "The Storm" by McKnight Malmar was adapted several times in addition to its Thriller incarnation. Twice it was dramatized on Studio One, in 1949 starring Marsha Hunt, and again in 1953, starring Betty Furness. A decade after the Thriller episode, Elizabeth Montgomery starred as the terrified woman in the TV movie, The Victim, directed by Herschel Daugherty! The story first appeared in the February 1944 issue of Good Housekeeping. You can read it online here. PE: David J. Schow and Larry Blamire discuss the many incarnations of "The Storm" on TV (including the info that Yul Brynner may have directed a 1948 version for Studio One). Make sure you have a pen and paper handy. You'll want to jot down the titles of the creepy shows that Larry hurls forth at one point. Good catch on that "An Unlocked Window" visual, Larry. You won't believe it, but it's in my notes. Damn these commentators. Taking all my best bits. 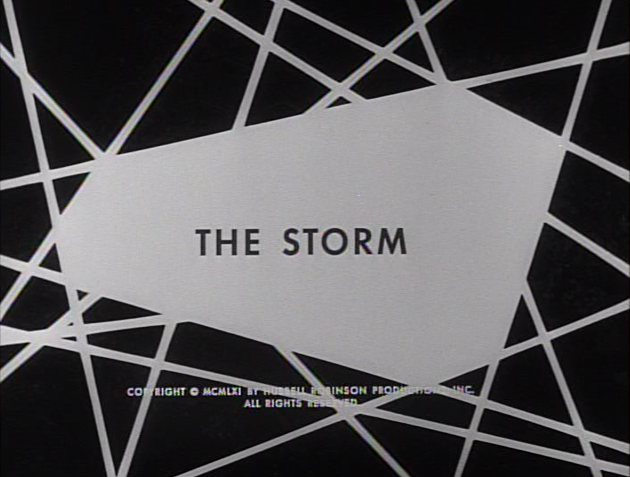 To me "The Storm" seemed too much like a return to the early crime episodes, most of which were ok but nothing special. Though Nancy Kelly was good the whodunit element was lacking because there were basically just two suspects: the creepy taxi driver and the husband. Which means at the end when it turns out to be the husband, my reaction was a less than thrilling ho-hum. I had the feeling that I've seen this episode many times over the years. This episode was pretty good. I agree with you guys that the ending was a little too abrupt and the episode would have benefited from the husband either finishing off the wife, or the wife getting lucky and rubbing him out, at least something. The cab driver was the ultimate cockblocker! In case anybody likes westerns, David McLean starred in a short-lived western called "Tate" which was very good. It was a summer fill-in that never got renewed, but it holds up with the likes of Have Gun Will Travel and Wanted: Dead or Alive. It's available on dvd. I guess I'm in the minority on this one then. Schow, Blamire, Rapchak, where the heck are you? I'm in Dodge all alone and being backed into the corner. I'll stick to my guns in thinking it's a very effective and very creepy ending. And thanks for the "Tate" recommend. I've popped it into my Netflix queue. I'm always looking for TV westerns with a bit of edge. A one-armed gunman sounds very edgy! Can't really help you out on this one, even though I think the episode is basically solid. The abrupt, question mark ending was certainly striking but, after such a LONG introduction, exposition and development (to use a few choice muscial/symphonic terms), one would have hoped for a more substantial ending---which COULD have included unhinged hubby singin' in the rain, but might have prefaced it with some more action between the two main characters. I mean, my goodness....we watched Nancy Kelly in what felt like an INTERMINABLY long set-up (now she's lighting the fireplace, now she's feeding the 19th-century Italian demon kitty, now she's lighting a candle, now she's putting on the raincoat and hat (AGAIN) to check the cellar door..or is it the shutters this time...?). JEEZ! Since we sat through all of this stuff, WHY NOT a bit more of an action pay-off at the end? ; why not have hubby chase her around the house for a while, just for fun? As our distinguished commentators said, the original story, (which apparently is folded into this episode quite literally), would have taken half an hour to tell, without all of the padding. Thus, this episode of Filler (oops...sorry) THRILLER could have been done effectively in half the time. Having said all of this, I still thinks it's well done. Nancy Kelly is excellent, Daugherty's direction is solid and (as Larry Blamire points out), the editing helps tremendously in maintaining an effective rhythm. Wonderful photography, perhaps Thrillers' BLACKEST, darkest show of all. Rain and wind machines worked overtime, to great effect. Cellar scenes were really creepy..the dead body, the "fake" dead body, etc, plus the opening murder..all first-rate Thriller stuff. But overall, this reminds me of one of them-there artsy European-style, psychological drama/horror/mystery films of the early '60s, very atmospheric but very methodical, where sanity/reality and imagination/dementia begin to blur; it requires lots of viewer patience to really appreciate. SEVEN rain-soaked, water-logged Karloff heads. Help's on the way, Peter! A 60s show with a non-pat, unpredictable, raving animal lunatic ending? Yes, please. Like Peter, I find the image quite lingering and effective. Course, I'm a pat-ending hater from way back. Although it's certainly clear to me that a) she gets away, and b) he's freakin' insane. It was just stated with a single image and without the usual punctuation. I think "The Storm" classifies as horror for sure. It has certainly enough of the necessary elements (see Peter's list) and it uses them quite effectively to make something that's pretty damn scary. The whole thing is way too much the stuff of nightmare to be classified as just another crime show. Kelly's terrific, and let's give James Griffith some props as the cab driver doing that subtly creepy thing he does. I was waiting for this episode for the opportunity to plug another Griffith vehicle; a very effective suspense-noir episode of HAVE GUN WILL TRAVEL called "The Waiting Room". It's a really nice showcase for the man. I offer up many Karloff heads for this one. And for those of us who have Netflix, "The Waiting Room" (Season 5 Episode 23) is on Instant Watch. I know what I'm watching tonight. I'm a big Griffith fan, too; love his work in "Parasite Mansion". Didn't think the direction of his scenes in "The Storm" allowed him to make anything near the impression he could have. Thanks for the "Have Gun" tip; I'll watch for it. Post about it here, after you watch "The Waiting Room"--like to hear your reactions. "The Waiting Room." These Have Guns are the perfect running time (25 mins). They're lean with no padding. This one was very effective, you're right, Larry. Loved the scene when Griffith tells Paladin he's going to enjoy the fire once the gunman is dead. Paladin just inches that rifle up to Griffith's face and Griffith's proclamation turns to a mumble. And you picked a perfect episode for you and I but the rest of the folks around here would hate it: it has just as an abrupt finish as "The Storm." Loved it! The abrupt ending in-and-of itself is not the problem for me; as the final shot of a taut, half-hour story [with more interaction between the couple], the final shot would have been fine. It's the fact that the over-all shape of "The Storm" is way lopsided; it takes FOREVER to get hubby and wife together, then gives us a fairly minimal amount of conflict between them, and then expects us to get all worked up over his existential cry to the heavens. I'm sitting there saying..."what was THAT all about? Nancy got away...final credits... I'm going to sleep". An abrupt ending, when well prepared, can be a thing of beauty. PS-- Where/how can I watch the "Have Gun" with James Griffith? Pete: Glad you dug "The Waiting Room". And that is a beautifully played Griffith mumbling moment you cite. You know, I thought about the ominous "left hanging" ending of this HAVE GUN. How ironic is that? Also, doesn't hurt having Harry Dean Stanton and LQ Jones in there. A choice episode. Larry R: Actually, I didn't see his cry stemming from anything in their relationship (which, as you say, we really know or care little about), so much as the suddenly fused circuits of a cocky sociopath who's been bested (and is now royally screwed). So getting wife and hubby together earlier only would have ruined it for me. Ruined, that is, the delicious expectation of a woman in the house alone on a dark and stormy night. In fact, Kelly and the house make up the far more vital relationship in the piece. Sometimes in horror, I think there's nothing scarier than when nothing happens. I wish i had read these comments before trying to digest this episode cold turkey. There was plenty of 'thriller' ambience -- wild weather, a creaky, shutter-banged house cloaked in darkness, a prowling cat... Kelly's back-and-forth wandering did nothing to instill tension, tho. Altho we had the nicely shot prelogue, where actual energy and action put me in the mood, it was doused through the 25 minutes of stagnant trapsing around the house. Immediately from the first flashback i could see the hubby was no good and despite the near-perv effort of the cab driver i felt he was harmless. 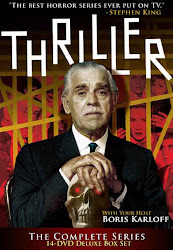 The photography was suitably dank and the ending, while abrupt and less than closure, it was at least a twist -- worth half a Karloff. While I didn't catch Paladin's waiting room, i did just earlier view TZ's And When the Sky Was Opened... Now that was a thriller! I found this one to be a real gem with echoes of 'The Spiral Staircase' and 'Sorry, Wrong Number'. The opening by itself was masterful with its ferocity, energy and cunningly framed compositions, it reminded me of the young David Lead and the photography, so refreshingly different from the exquisite work done by Kline, Thackery and Lindon, had its own unique signature - reminiscent of Joe August's brilliant, boldly dramatic lightng schemes from his work with Dieterle. These guys seemed to actually be trying out perform each other! Or at least keep up the standards. If 'Thriller' had to do a woman stalked in a lonely, rain swept house episode, this is the way it should have been done. It also reminded me of the British THRILLER which had several similar plots. Hey guys, wouldn't it be interesting to have that show follow this one, with a day by day review. The ending is marvellously memorable and burns itself, pleasingly. mundane and boring. It can be found on the 'Studio One Anthology' box set released a few years ago and which I only brought for the rediscovered TV version of '12 Angry Men' (the ultimate extra to go with my 2 disc dvd of the classic film). It should be avilable via netflix. For me, this may be one of the top two or three best crime THRILLERS (ranking with 'Last of the Somervilles' and 'Late Date'). Three Karloffs out of four. arrrrhhhhhh....posted a comment and it went a page that said "URL too long" and lost me all of it. Well guys, if THRILLER had to do a lone woman stalked on a dark and stormy night cliched story, this is one I'd want. I found this to be one of the two or three best crime thrillers with a splendidly staged, masterfully composed and ferociously edited prologue that reminded me of the young David Lean. Echoes of 'The Spiral Staircase' and 'Sorry, Wrong Number' abound and the episode has a suspenseful ambience, cosy yet with lurking danger. The ending burns away at the memory, pleasingly, ambiguity or no ambiguity. The photography by Warren has a unique tinge to it, it's own signature, reminiscent of Joe August's boldly dramatic lighting schemes for William Dieterle in the '40s which often obscured all but the eye line. Interesting to compare it to the marvellous lensing by Kline, Thakery and Lindon. Were they trying to outdo each other or just keep up? It also has a strong kinship to some of the British THRILLERS (which were, again, a mixture of the crime and supernatural). I hope you guys give it the same, one a day treatment. That would be mighty interesting. I watched the second version after THRILLER's, which was directed by Yul Brynner (yep, the bald King himself). It's flat, stagy, mundane and padded out with the short story the basis of the last 10 or 15 minutes and much of the opening half about how the couple meet. After two weeks in which I watched 'Marty', 'Patterns', 'Requiem for a Heavyweight', 'Days of Wine and Roses', 'The Defender' and 'No Time for Sargents', a good reminder of the mundane dross from the same era. For those of you who'd like to check it out, it's a part of the 'Studio One Anthology' box-set from several years back and should be gettable from Net-Flix. The only reason I got it was the discovery and release of a full print of the TV version of '12 Angry Men' - the ultimate special feature for my two disc edition of the classic film. Oh, a quick question for David and Gary and Tom...can you guys point me to any resources for this show, apart from the links David has already posted, Warren's book and Fangoria's Doug Benton interview? Are there any interviews with William Fryre, Donald Sanford, Robert Bloch and Douglas Heyes? Hell, any of the directors or composers, photographers involved? I'm thinking of 'Starlog', FilmFax', 'Tv Guide' ect, ect. I have a gnawing ache to learn even more. Well, I'm not Gary or David or Tom or Gary, but I can direct you to Filmfax 29 and 30, where a big Thriller piece ran. Of course that piece ran first in Midnight Marquee #39. I'd recommend you find the Marquee issue (don't try it through their website as it's at an overinflated price of $75!) but the Filmfaxes are probably easier to find ($10 each from the Filmfax site). The piece is written by Jay Allen Sanford. I've got Studio One all queued up from Netflix. Thanks for the warning. I'll edit my picks a bit. Just got "The Defender" last night. I also own the STUDIO ONE box set; I've had it for a couple of years, and keep waiting for the right time to sit down and watch it carefully. Thanks for the heads up on "The Storm." I also bought the set for the original "12 Angry Men", which I greatly anticipate watching, after so many years of reading about it (as a film trivia question, I often ask: "name the 2 actors AND their jury numbers who played their respective roles in BOTH the tv and film version of "12 Angry Men." Haven't got a correct answer yet; you'll know, of course). The Storm let's us share some quality time in an empty house during an evening of a torrential rainstorm while waiting for a somewhat mysterious hubby to arrive. The prologue gives us a jarring murder of a young lady. After that we are in a taxi ride going home with the lady and creepy, but obvious red herring, cab driver. One we get inside the house, we are treated to most of the old dark house cliches, but these flapping doors and window shutters still work their well worn spook factor. If Val Lewton directed an episode this would be it. As soon as the flash back with the mysterious hubby appears, we know who'll join us for the show down at the end. Despite all this genre and plot knowledge, Herschel Daugherty does an excellent job of ratcheting up the tension. Nancy Kelly drips the frazzling nerves at the right pace. When the deranged hubby arrives, things sort of get muddled and the ending doesn't quite satisfy, but it was still a decent Thriller episode. 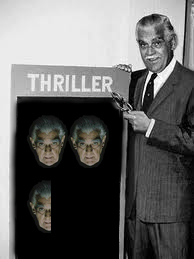 The Storm blows in two and a half Karloff heads. No one could play a woman ar her wit's end better than Nancy Kelly. The Storm would make a good companion piece for a Nancy Kelly DVD set, paired with The Bad Seed. That one was set mostly in the daylight, had a deceptively benign postwar suburban ambiance. The Storm is a Gothic from the git, and a damn good one. James Griffith's voluble and, at times disturbingly forward red herring cab driver was a nice touch, and I wonder if anyone noticed that while we see his headlights after Kelly is indoors, we never actually see him drive away. Miss Kelly never looked out the window to check,--this was way before criminal profiling and Mary Ellen O'Toole--she'd have been wise to have taken a peek just to make sure he was gone. The guy's "familiarity" was unsettling. The cat's reactions were maybe a bit too pat and neatly timed; and the business with the owl a cliche, though a well handled one. But then the ep was a cliche to begin with, or a series of cliches, in a cliched house isolated from the blessings of civilization. What made it so wonderfully Thrillerish was in the way the old wine was poured into the new bottle. They made a nice job of it; and the wine and the bottle were both excellent. I'd seen this before, just caught it again on MeTV, and the Big Reveal ending was actually a shocker, as I'd forgotten how it ended. I vaguely remembered the story, who the perp was, not how the story concluded. The actinfg was all-round excellent. A top of the line Thriller, and a real keeper. This exemplifies the pleasures of the predictable, you know exactly what you are going to get in the first ten minutes, and you guess the murderer shortly after that. But most viewers would have hunkered down hoping for the best, and they get it here. This would never work with a less expressive and sympathetic actress than Nancy Kelly. At the beginning of the '40s, she was one of the plainest and dullest of the Girls-Next-Door that were so popular then. It's no surprise that Fox dropped her soon after the gorgeous Gene Tierney was signed by the studio. But Kelly was good. And she got an Oscar nomination for her 'comeback" THE BAD SEED, which she had been a big success in on Broadway. And she's great here. Can you imagine any network today featuring a haggard middle-aged woman as the focal point of drama and sympathy? I think she would have been too plain for even Lifetime. But this works as well as it does because of her. Count me as one who found the abrupt ending irritating. Did they shoot a different ending that they scrapped? First rate nerve-jangler-- the brief cast brings it... especially Nance Kelly, with a close second going to "Ba-Ba" the cat. Fantastic. I think that David McLean deserves more than a few words of praise. His performance is brief,--maybe no longer than James Griffith's--but he works wonders with the little time alloted to him and his character, with his personality shifting from reassuring, strong and likable to just a bit shifty; then more than a little too insistent that his wife doesn't at least report that something has happened to the polce, to negative, borderline bullying,--but still maybe he's just hiding something else--and then his "take charge" self takes over and it's too much. The viewer knows, some evidence makes it clear; and then the fun begins. McLean's then very rapid mood swing in the downpour is so effective that I can't help wonder why he didn't have a better career as an actor. He did a superb job in The Storm, deserved better than what he got. This remains my favourite “go-to” episode of Thriller to watch on a dark, windy, stormy night. Even better when you watch it in the dark or with just a flickering candle. Love the scoring and editing. Gives me chills every time I watch, which is frequently.